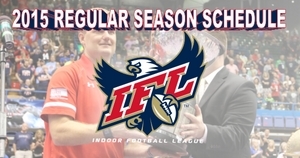 The Indoor Football League (IFL) is proud to announce its 2015 regular season schedule. The 17-week, 70-game season kicks off on Saturday, February 28th and concludes on Saturday, June 20th. The IFL’s ten teams will play fourteen games (seven home/seven away) over 17-weeks. Each team’s three bye weeks occur sporadically over the course of the season. Postseason play will begin the weekend of June 26th and will culminate with the United Bowl Championship during the weekend of July 10th. Additional details about the postseason format will be released in the coming weeks. The Indoor Football League was created in 2008 from a merger between the Intense Football League and the United Indoor Football Association. Its teams are located from Kennewick, Washington to Green Bay, Wisconsin. For more information about all things IFL, please log on to www.goifl.com or call the league office at (804) 643-7277.